Discussion of the loans appears as the very final item on the agenda for the Management Board, which is scheduled to begin its meeting at 1 p.m. at the Walton County Government Building in Monroe. The agenda indicates the Board is to discuss a “time line for loan execution.” According to that time line, the Oconee County Board of Commissioners is to approve the loans at its meetings on Oct. 30 and Nov. 6. Walton County is scheduled to give its approval on Nov. 6. The loans will become effective on Nov. 19, according to the agenda available on the web site of the Hard Labor Creek Reservoir Management Board. The larger loan was for $20 million. The two counties will not be required to make any payments on this loan until it comes due in 40 years. No interest will be charged against the loan during construction of the reservoir, and the single balloon payment will be of principal and 1 percent interest. The counties will be required to make only interest payments during the first five years of the loan and begin paying against principal after that point. Neither loan will have any closing fees. Construction of the dam is scheduled to be completed in May of 2014. The allocation of funds to Oconee and Walton counties was the largest amount made by the state on Aug. 1, which awarded $90.5 million in loans and $9.1 million in direct investment for water projects. The counties could decide to accept one or both of the loans, or they could reject both, but they have said they don’t have the ability to build the reservoir without the state funds. The counties had asked for the money as a state investment in the reservoir, rather than as a loan, but the state rejected that request. The state loans would give the two counties money to build the dam to create the reservoir. The loans would not provide sufficient money to build a water treatment plant or distribution system for any water such a plant would produce. At present, neither county needs the water the reservoir will provide, and one criticism of the project has been that, at least in the short term, it will do more to help land values around the lake than serve water needs of Oconee and Walton counties. In the application for the state funds, the counties made it clear they were willing to share the water with regional Atlanta. 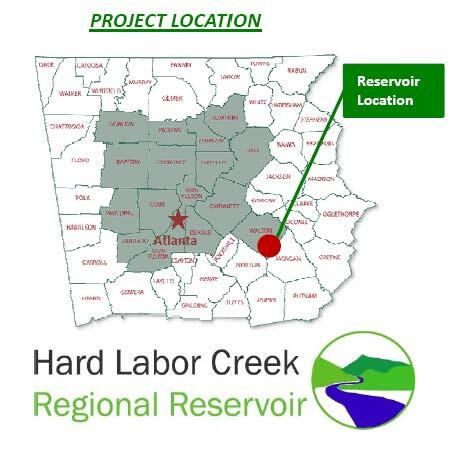 Based on existing connectivity, according to the documents, water from the Hard Labor Creek Reservoir could be transferred to more than 30 utility systems. In the initial stage, the reservoir would be filled only by water from Hard Labor Creek itself, also a tributary to the Apalachee River. In the second phase of the project, up to 60 million gallons per day of water would be pumped from the Apalachee River near the Walton, Oconee and Morgan county borders and used to fill the reservoir to a level that will not be possible with the water from Hard Labor Creek itself. When it joined the HLC project in 2007, Oconee County surrendered to the two-county project a withdrawal permit for water from the Apalachee River that Oconee County was issued by the Georgia Environmental Protection Division. The first phase of the project will produce 13.3 million gallons per day of water. The second phase would increase the capacity to 41.1 million gallons per day of water. Total cost of the two phases of the project is estimated at $350 million. I obtained complete copies of the applications of the two counties for the state funds from Chris Manganiello, policy director of the Georgia River Network, based in Athens. He obtained the documents directly from the Georgia Environmental Finance Authority. In addition to indicating how strongly the two counties pitched the availability of water from the Hard Labor Creek project to metro-Atlanta, the applications also provided other details of the argument made for the reservoir. Both counties projected large growth in their populaitons to make their case, even misrepresenting the size of the counties in 2010, when the last Census data were released. Both counties also promised to continue raising water and sewer rates as part of their contributions to the reservoir construction. In Oconee County, those rate increases are expected to be 3 percent each year. In Walton County, the increases are expected to be 5 percent. The counties said the project would be a recreational asset for the region and would help with economic development. The Oconee County application list the county population in 2010 as 34,503 and projects that figure to increase to 39,121 in 2015 and 48,233 by 2020. The projection for 2050 is 122,875. The Census Bureau, based on the 2010 Census, listed the county population that year at 32,808 and estimated the 2011 figure to be 33,366. The Census Bureau estimates the county be growing at an annual rate of 1.7 percent. At that rate, the county would have a population of 35,693 in 2015 and 38,832 in 2020, or nearly 10,000 less than the projection offered by the county in the application. The application attributes the population data to the Upper Oconee Regional Water Plan, and the figures can be found in Table 1 of that report. 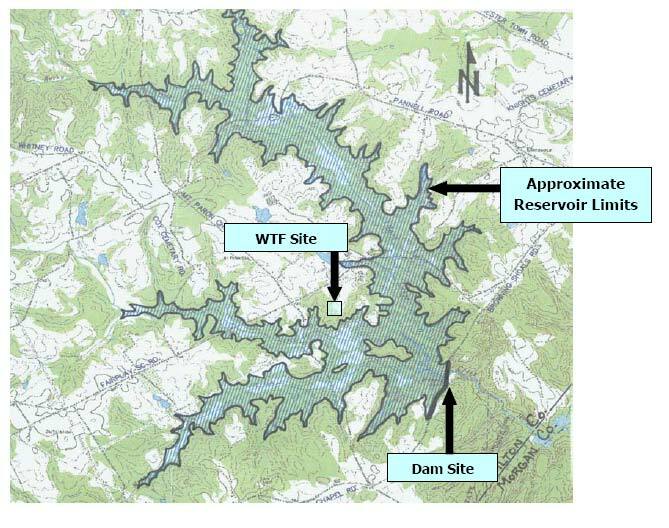 Oconee County officials also used very high estimates of population growth to justify the decision back in 2007 to join with Walton County on the Hard Labor Creek Reservoir. The Walton County population estimates, also from the Upper Oconee Regional Water Plan, also are at odds with the actual count from the Census Bureau and the Bureau’s projections. The application lists the 2010 population at 91,068, compared with the Census Bureau count of 83,768. The application projects a population for 2020 of 118,742. The Census Bureau shows a growth rate of 1.0 percent, which would produce an estimate of 92,503 for 2020. Some of the money to pay for the Hard Labor Creek Reservoir will come from the projected growth in population, the applications the two counties filed said. But a significant amount of the revenue is to come from the rate increases, which apply to existing customers as well. In Oconee County, according to the application, regular population growth in fiscal year 2013, which started on July 1 of this year, will produce $399,435 in new revenue, while the increase in water and sewer rates approved by the Board of Commissioners to start on that date will provide $202,950 this current fiscal year. Of the amount coming from the rate increase, $174,450 is to come from existing customers, according to the county application. The base rate for residential water customers in Oconee County went from $17.50 per month to $18.00 on July 1, or an increase of 2.9 percent. The base rate for residential sewer customers went from $19.50 per month to $20.50, or an increase of 5.1 percent. The current budget for the Oconee County Utility Department includes a payment of $936,263 on the $19.5 million bonds the county has sold as its contribution to construction of the Hard Labor Creek Reservoir. The payment is for interest alone, and no payments against principal are included in the budget. About 30 percent of the Oconee County population at present relies on its own wells for water, according to the application. The number of citizens on wells is expected to stay about the same across time, but it will become a smaller percent of the whole as the population grows, largely in areas served by county water. At present, the County has 8,061 residential water customers and 689 commercial water customers, according to the documents submitted. It has 1,125 residential sewer customers and 404 commercial sewer customers. Oconee County said it has a water surplus at present, but it anticipates a shortfall by 2015 because of the projected population growth, the same year that Walton County said it will experience a shortfall. Water from the Hard Labor Creek Reservoir will not be available for treatment until 2016. This conflicts with what Oconee County Utility Department Director told the Board of Commissioners earlier this year. Thomas told the Board he has solved the problems of the iron and manganese with new technology, and the BOC voted in February to sell a half millions gallons per day of water to Walton County because of the surplus created by the water from its wells. 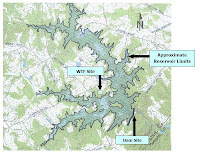 The reservoir will have benefits beyond provision of drinking water to citizens of metro-Atlanta and north Georgia, according to the application documents. “The Hard Labor Creek Regional Reservoir will consist of a 1,416 acre lake that will provide opportunities for sports fishing, passive parks, walking trails, and other outdoor activities for citizens across the state,” the document states. In addition, the reservoir will help “sustain the future economic growth of the north Georgia region” by serving new corporate customers. 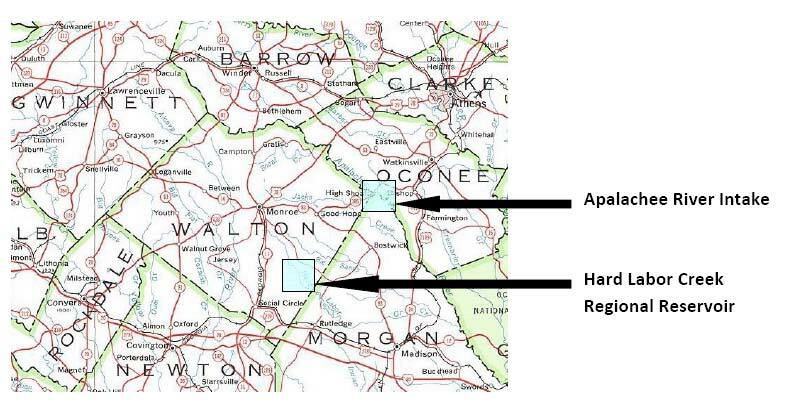 The document mentions Caterpillar in Oconee and Clarke counties, General Mills in Walton County, and Baxter Pharmaceuticals, at the junction of Morgan, Newton and Walton counties, as examples of customers needing additional water. Oconee and Walton counties had asked the state to make a direct investment in the reservoir, that is, give the counties money to build it, rather than offer loans. In return for the state investment, the application filed by the Hard Labor Creek Management Board offered to give the state ownership of the dam, the intake structure in the lake, buffer land around the lake, a preservation area, and two mitigation sites, one of them on the Apalachee River in Oconee County. The counties proposed to give these assets to the state and then sign a 40-year lease for them at “fair market value.” The counties also would have had the right to buy back the assets. The state rejected that offer, providing the loans instead. The $32 million from the state will be combined with the $52.9 million in revenue from the bonds sold by the two counties and $6 million in other revenue, including from user fees, to cover the $90.9 million needed to get the dam built and water in the reservoir. According to the application document, as of March 31 of this year, the project had $27.6 million in unspent funds. The agenda for the Hard Labor Creek Reservoir Management Board meeting on Tuesday states that the Board has until Aug. 24 (Friday) to provide to the state required data and documentation regarding the loans. The Georgia Environmental Finance Authority is expected to provide the final loan documents to the two counties on Oct. 8. The Management Board is scheduled to approve them at its meeting on Oct. 16, according to the agenda. Before getting to the loans, the Management Board is scheduled on Tuesday to discuss land acquisition, dam construction, road relocations, construction of the intake, and project mitigation. Oconee County has three members on the seven-member Management Board. The Oconee County members are commissioners Jim Luke and Chuck Horton and Finance Director Jeff Benko. Thanks very much for this report -- very important stuff. I'm curious: What is the origin of the map shown at the top of the post? What is the significance of the shaded counties? I should have indicated that all of the maps and other images used in this report came from the applications filed by the two counties. The first map comes from a section called "Project Narrative" and is followed by the statements quoted in this report about the reservoir providing a "safety net" for the "metro region." Thanks, Lee - I remember seeing it now. It's an interesting map to include in the application. The shaded counties cover several river basins and include most of Metro Atlanta, but do not represent the Metro North GA Water Planning District (of which neither Walton County nor Oconee County is a part). In fact, I notice now that Oconee County is not shaded, while Walton is. Odd. Thanks again for your reporting on the reservoir. Walton was part of the Metro North Georgia Water Planning District but withdrew. This map appears to be from when Walton was in the district. It withdraw after Oconee joined with Walton for the Hard Labor Creek Reservoir. Oconee was never a part of that group. ...all of which goes back to the question of where exactly it's being proposed that the water might go. As you know, there are numerous problems with the idea of piping water from the Oconee River basin to Metro Atlanta, beginning with the question of whether it would actually be wanted or needed there. If Walton and Oconee take on these additional loans, it seems the most likely outcome will be that existing local ratepayers will continue to shoulder the burden of paying down the debt for the project.